When Randy is asked to give a “last lecture” at Carnegie Mellon University, he knows that he has cancer, but he hasn’t yet found out that it is terminal. During his cancer treatments, Randy receives incessant emails about what his lecture will be about, but he can’t figure it out. The week before he has to decide, he finds out the illness is terminal, and he knows the University will let him cancel the lecture. He discusses it with his wife Jai, and she’s wary of Randy giving the lecture. Since the family just moved, and Randy is dying, Jai wants Randy to spend as much time as possible with her and the kids. Randy listens, but can’t let go of his urge to give the lecture—he notes that throughout his academic career, he’s been known for giving great lectures, but he feels he has one truly great one still left to give people. In a way, Randy uses perhaps the biggest obstacle life can throw at you (imminent death) as an opportunity—the opportunity to give one final lecture to cap off his career. Also, the lecture will serve as Randy’s final tribute to teaching and learning: he will be lecturing a room full of students, and he will leave the video of the lecture behind for his kids to teach them a little something about their father. Randy and Jai can’t come to an agreement, so they go discuss it with their psychotherapist, Dr. Michelle Reiss. Jai argues that Randy’s a workaholic and doing the lecture will take up all of his time, and, on top of that, he would have to fly to Pittsburgh on the day of Jai’s birthday, which is probably the last one they’ll get to spend together. Still, Randy can’t let go of the idea of giving the talk, because it gives him a chance to “really think about what matters most to me, to cement how people will remember me.” Dr. Reiss finally weighs in that they have to make this decision on their own. Like other obstacles, Randy frames his terminal diagnosis as an opportunity—it gives him a chance to reflect on what he considers to be important in his life. Rather than feeling sorry for himself, Randy uses the harsh truth of his imminent death to dig deeper into himself, in the hopes of maximizing the time he has left and leaving some of his wisdom behind for students to absorb. Randy reflects on why he wants to give this talk so badly—he confesses to Jai that he sees his last lecture “as a vehicle for [him] to ride into” a future that he’d never see. He reminds Jai that the kids are young—five, two and one—and will probably barely remember him when they grow up. He wants to give them answers to the questions they’re bound to have—Who was Dad? What was he like? This lecture, Randy argues, will help them know who Randy was and what he cared about. Jai agrees, but then asks why he can’t just record videos for the kids in their living room. Randy says that a college campus is his natural habitat, and also that kids listen to advice much more readily if it’s validated by people other than their parents. Finally, Jai relents, allowing him to go give the lecture. Randy’s last lecture isn’t entirely about himself or his students—it is also about his kids. Randy sees the lecture as having the ability to bring his words and ideas to the future in order to teach his kids lessons that he won’t be around to impart. Randy knows the audience will expect his lecture to concern death, so he uses this expectation (which might, in some contexts, be considered an obstacle) as an opportunity to teach his audience about a topic on the opposite end of the spectrum: childhood dreams, and how to live your life with those in mind. 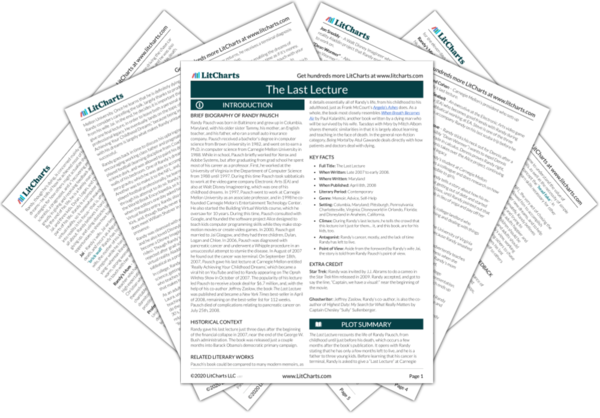 Get the entire The Last Lecture LitChart as a printable PDF. Koltun, Moe. "The Last Lecture Chapter 1: An Injured Lion Still Wants to Roar." LitCharts. LitCharts LLC, 26 Feb 2017. Web. 21 Apr 2019. Koltun, Moe. 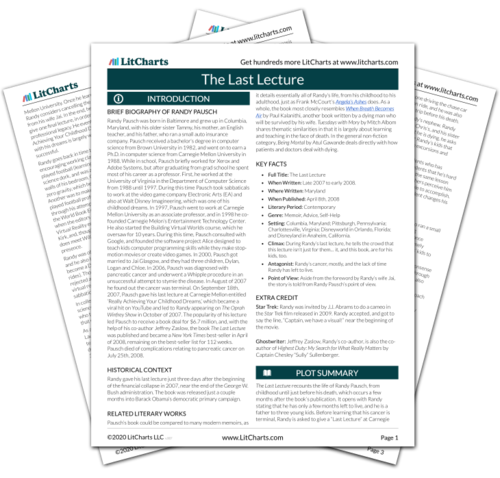 "The Last Lecture Chapter 1: An Injured Lion Still Wants to Roar." LitCharts LLC, February 26, 2017. Retrieved April 21, 2019. https://www.litcharts.com/lit/the-last-lecture/chapter-1-an-injured-lion-still-wants-to-roar.